After a long time, I attended a full NASSCOM conference (Yes, all of three days!!). Artificial intelligence is going to the refinery plant. 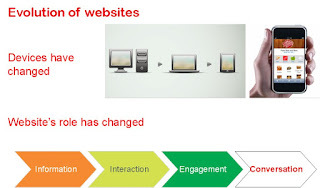 from single user interaction to single object - multiple users interactions on real time basis. From FoodTech couple of years back and to Fintech last year… this year will be about HealthTech. Why do technology firms talk about VR / reduced attention span, etc. but have day long conferences & have has physical conferences rather than virtual hangouts? Messenger is more important than the message: Two business leaders having divergent views on same subject (demonetization) receives applause from the same audience. We live in the ‘Now’ moment: As the field of technology rapidly changes, most of the business leaders have a focus on what is the current need and try and identify solutions that best suits their current challenges. Also, they consume information for the moment with little action points.